It is an air compression device with multiple chambers that compress in succession. Our massager increases blood flow through your muscles, which has been shown to aid sports and other recovery, similar to the effects of a professional massage. How does the Air Relax Compressible Massager Work? After fitting both legs into thigh-high cuffs, just sit or lay on a flat surface of a bed, floor or couch and let the technology do the work. The leg cuffs have hoses that connect to the air compressor. Once the compressor is turned on, the air chambers in each leg cuff fill up with air in the sequence you choose, gradually compressing each muscle group in the legs and feet and then repeating. You may choose the compression sequence you like the most. Massage therapy will increase circulation and will flush lactic acid from a user’s legs after a tough workout or standing for long periods. How many modes does Air Relax Compressible Massager have? You can choose "A", "B", "C" mode. Press the "MODE" button once to change the mode. "A" mode inflates the chambers from the bottom up, one at a time. " B" mode also inflates the chambers from the bottom up, but maintains the pressure in the lowers chambers as it works its way to the top. "C" mode maintains pressure in all chambers at once, and then releases. Pressure area is changed whenever the button is pressed. How does AUTO button on Air Relax Compressible Massager works? "AUTO" function starts when it's pressed during the operation. "AUTO" program combines "MODE" (A, B, C) and "POINT. "B" Mode - "POINT" Mode- "C" Mode - "A" Mode- " POINT" Mode - "B" Mode- "C" Mode - "A" Mode. How many Pressure levels does Air Relax Compression Massager have? Where can I use my Air Relax Compressible Massager? You can use your massager on legs only. Please do not use on your hands or other parts of your body. Is there any side effects of using the Air Relax Compressible Massager? It is recommended to use not more than 3 times a day for 15-30 minutes. Do not exceed the recommended time! There is no side effects, unless you use it more that it's recommended. Benefits of using Air Relax Compressible Massager? This product is intended for use by medical professionals and patients at home who are under supervision. In treating many conditions, such as: primary Lymphedema, Edema following trauma sport injuries, Postimmobilation edema, Venous insufficiencies, Lymphedema. Should I consult my doctor before using the Massagers? Our massagers designed for your personal use and is not intended to replace any health professional care. However, If you have any medical conditon, it would be best to ask your doctor before using the massager. The Air-Relax unit/accessories are warranted by the manufacture, against manufacturing defects in material and workmanship for a period of one year from the date of purchase from Air Relax Australia. In the event of any defect occurring during the warranty period, Air Relax Australia will, at its option, (a) correct the defect by repair or by replacement of applicable part or component that fails as a result of such defect. Without charge for the part and labor; or (b) replace the device with one of the same or then current design. 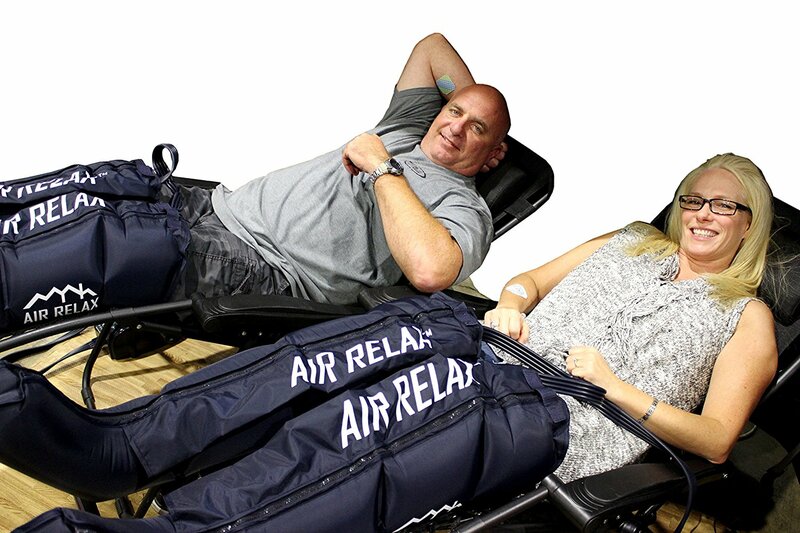 The Air Relax unit includes the leg cuffs, device and hosing. 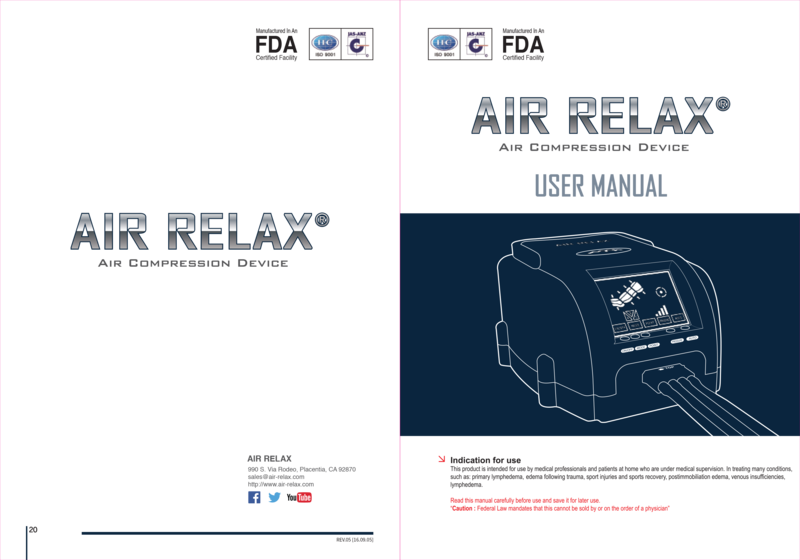 The forgoing warranty does not cover normal wear and tear or cosmetic damage, and are void if the device/accessories are not used in accordance with the Users Manual, are otherwise misused or modified in any way, and or repaired by anyone other than an authorised service representative of Air Relax Australia. This warranty expressly excludes transportation, shipping or insurance costs, or defects, damages or failure resulting from misuse, abuse, improper or abnormal usage, improper voltage use or neglect. To activate your Warranty Claim, Please email wade@titanperformancegroup.com.au with your proof of purchase and please describe the nature of the defect and we will get back to you within 2 business days. All replacement parts and products become the property of Air Relax Australia. Repairs/replaced parts and products are warranted for the remainder of the original warranty period only. You will be charged to repair or replace parts and products made after the expiration of the applicable Warranty period. These are the best of the rest. The deep tissue massage you get with the 230 mmhg of pressure leaves the others like reboot, normatec and recovery pump for dead. As an ironman triathlete these keep me fresh and mane training much easier as you're not training on sore heavy legs.